A single parent is, first and foremost, a parent. We have all the responsibilities any other parent faces, all the anxiety any other parent faces and all the joy any other parent gets from seeing our children growing up into the people we hoped they would be. Though I don't want this forum to become a place where we bemoan our terrible fate, there are a few differences between single parents and other types of parents. This means that having an Internet community for single parents will make a very real difference in our lives. And this is why: I spoke of responsibility, anxiety, and joy. A single parent has all the usual parental responsibilities, but typically carries them alone. It's the single most common threat, and it appears in many disguises: "Wait till your father comes home." "When your mother finds out what you've done, you'll be in big trouble." "Can you imagine what Dad will think when he hears...?" Most parents have used this getaway, at least once. It's an escape hatch, so we can think. We need to figure out how we can really do something to this child to change this behavior. Q Dear WholeFamily Counselor, Hi. I have a 16-year-old that is very resentful and never wants to do anything or go anywhere with me. I've tried forcing her to go to counseling and she refuses to go. She is okay at times but when I ask her to do chores around the house she mumbles under her breath and then proceeds to do whatever I asked her to do. She wakes up in the morning with the nastiest attitude. Many times I just want her to just go live with her father so that she can see how good I really am to her. I pray that someday she will be a happier person. Q: Dear Dr. Sylvia, My brother is raising his four-and-a-half year old son on his own. The boy sees his mother and sister every other weekend. My brother loves his son and is struggling with patience to deal with a child of this age. My parents do what they can to help. My nephew is in Head Start every day, and then, stays with my parents until his dad gets home from work. My brother's job is very frustrating, and many times when he gets home, he is not in the best frame of mind. It is hard for him to be "mom" and dad, but he tries really hard. My nephew is fine with my parents, but when his dad picks him up, he misbehaves. More than half of the marriages in the U.S. end in divorce. So there's a good chance that either you or a friend of yours has parents who are splitting up - or who already have. Your Stories (Children of Divorce) Divorce hurts. I don't need to tell you that. You might feel a lot of pain and be very sad. You also might feel like you're going through this all alone.Well, you're not alone. Just look at what Brandon's going through. QDear Dr. Sylvia: I am a mother in the middle of a divorce and a vicious custody battle over my 12-year-old son. My son's father is brainwashing him against me, but my son's therapist has been telling him not to say anything negative against his father. How can I get these awful ideas about me out of my son's head? 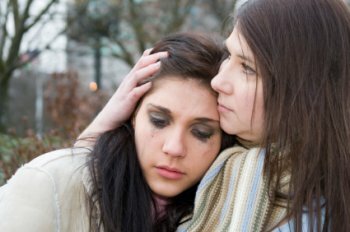 -- Victimized Mom A Dear Victimized Mom: Your son's therapist is giving your son good advice. Q: Dear Dr. Sylvia, I have been the residential custodian of my 15-year-old son since he was born. During that time, his father has maintained a responsible and regular presence in his life with weekly visits, weekend sleepovers, and vacations. During the past four years, however, the day-to-day responsibilities of raising my son became more difficult. He was diagnosed with ADHD and a learning disability in fifth grade, and trying to find the right combination of medication and behavior modification combined with pre-adolescent hormonal changes took its toll on both of us. Exclusive to WholeFamily.... QDear Dr. Sylvia I'm having a hard time with my twelve-year-old son. School has been in session for about two months, and he has five F's right now. He will not do school work or homework. He has already been suspended from school for three days because he took a bullet to school. He lies all the time. He hits his sisters a lot. I am a single parent, and I don't know what to do with him.